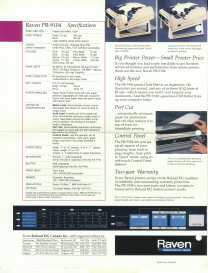 It was brought to my attention that it was very difficult to find a user guide for this printer on the internet. Ted Edwins of Guelph, Canada has generously accepted to scan my manual and did a great job creating some PDF files including bookmarks. Links to download are below. By the way, if you want to use this printer in Windows XP, just select the Panasonic KXP-1180 in the Printer Control Panel, they are almost identical as far as I know..
Roland Raven PR-9104 Operating Instructions. Here is the same info. split into 6 parts for you 56K users. 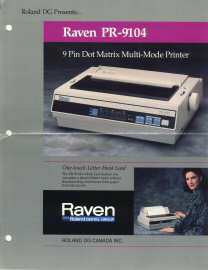 What's the difference between the PR-9101 & the PR-9104 ? As far as I know, the only difference is the PR-9104 is a bit faster.